KARACHI, Pakistan — It is one of the world's most violent places — where criminals, chronic power outages and even terrorist cells are part of life for many of its 20 million residents. But despite its chaos, Karachi has not escaped the "Pokemon Go" craze that has swept the globe this summer. The augmented-reality game has not officially launched in Pakistan, and hunting Pokemon in Karachi's streets is risky given the high number of muggings, kidnappings and murders. Nevertheless, Pakistani millennials — who feel underrepresented in this conservative-religious society — have found a way to download the game and are playing it on a specially organized bus tour dubbed the "Super Poke Express." "It's amazing," said 21-year-old dental student Maryam Qazi during one of the tour's recent outings around the sprawling metropolis. "A young woman on top of a bus in a city that people consider violent, playing Pokemon — and I haven't been mugged yet! It does shatter the norm." The tour is organized by the city's Super Savari Express operator. It was launched as a way for people to see the city and hunt Pokemon out of harm's way. "Playing it in England is different," said Mina Riaz, a 22-year-old who graduated from London's Royal Holloway University before returning to live in Pakistan. "You have the liberty to walk around and go to a park and play Pokemon and even meet other players." Based on the 1990s video-game franchise, "Pokemon Go" sees players exploring a real-world map and hunting computer-generated creatures. It has been downloaded more than 100 million times and is officially available in more than 50 countries. Although it has not been launched in Pakistan, players have been able to download the game by tricking their smartphones into thinking they're in a different country. The game is even more challenging in Karachi, however. The city has a wildly high crime rate and has served as a hideout for al Qaeda and Taliban leaders. Its port is the center of the region's drug and human-trafficking routes. "You can't roam around unless you're in a group," according to the tour's 20-year-old founder, Ali Lari. "You don't want to get taken away like a Pokemon." Women are particularly vulnerable. Acid attacks and so-called "honor killings" have become a weekly occurrence. These brutal punishments are meted out by families against their own relatives who are judged to have done something immoral. "Here, being a girl, I can't just get up and leave [the house] — there are a lot of questions which come your way," Riaz said. For a $15 ticket, customers get a five-hour tour as well as a battery pack, free Wi-Fi, and chicken or vegan sandwiches. 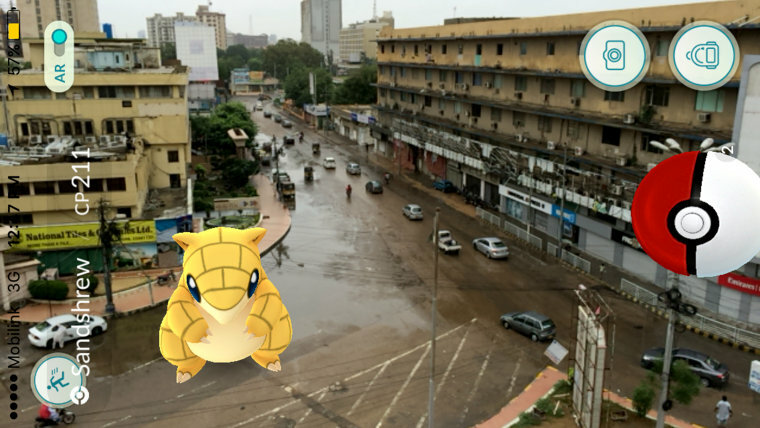 Rather than wandering alone through the city's dangerous streets, passengers can traverse Karachi in safety, visiting "Pokestops" — the name for the waypoints that generate important items within the game — and hunting rare digital creatures. And it's not just about Pokemon. Whatever they are visiting — a cathedral from the British colonial era, the mausoleum of the country’s founder, or the city's public beach — young passengers say the tour allows them to reclaim a stake in the city that many had written off. "We want to go and explore parts of Karachi that people don’t go to," said Lari, who boasts a mop of unruly hair and American accent. "We want to go to heritage sites and look for Pokemon." Most passengers are privately-educated young people from well-heeled families who would likely never mix with the city's sprawling masses. But for some the tour changes that, taking them to parts of Karachi they wouldn't explore otherwise. "I wouldn’t have come here if I were not with my friends," said 20-year-old medical student Alia Sohail, playing with her new Samsung phone as she sat on the top deck of the bus. "There is a divide between the classes in Karachi. The bus and Pokemon bridge it." The tour's creators know the product is niche. They only serve about 20 customers a week. But they think the concept is a winner. "Officially, the game isn’t even out in Pakistan," said 21-year-old Ibrahim Asad, another of the tour's co-founders. "But being Pakistani, we just have a way of getting things done."